Most of you people must be aware of the recent launch of Project Eve store in Pheonix market-city Chennai. I was one of the few lucky people who had a chance to attend their preview. 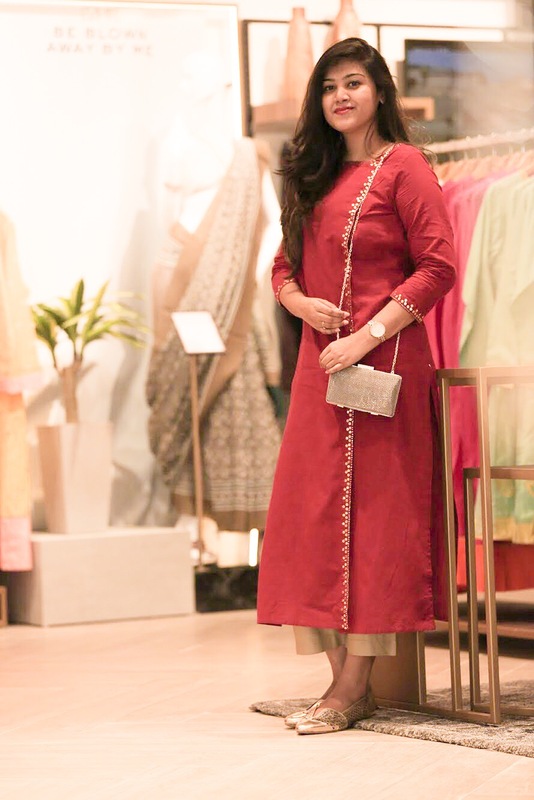 This is their third store in India and is a Unique experience store for women. The store's USP is that it has everything that a woman wants. Right from accessories, clothing to beauty products and much more. The store is an epitome of grandeur and also has a spa for you to take some time off and relax for a bit. The brand also provides you with an in-house stylist as well to suits your needs. The store has different sections according to different themes. They had rose themed prints, florals, party wear and lots more. I was instantly drawn towards their festive collection. The store has everything that you just need for the upcoming festivals. I also found few uber comfortable printed cotton garments which are just perfect for the season. I put together three of my favourite looks from the collection. For the first look, I layered a simple cotton asymmetrical maxi dress with a printed blue overcoat. The maxi is so versatile that it can be paired with a lot of things. I wanted to keep the second look simple yet classic so I chose this beautiful floral printed box dress. The dress has box sleeves which are extremely comfortable and i finished the look with a bright coloured box clutch. For the last look, i decided to pick something from their festive collection because diwali is right around the corner. I had to choose this bright coloured red kurtha which had gold detailing in the neck part. I paired the kurtha with gold culottees to add an oomph factor. I finished the look with a gold sling bag and gold shoes. I had an awesome time at the Project Eve store checking out their collection and putting togther looks. You guys should defenitely check it out because Project Eve is one of it's kind and their collection is fab.